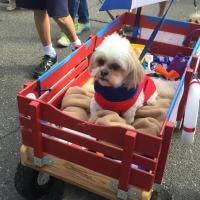 Getting dressed up may not be your thing, but browse the stores this time of year and you’ll see dog Halloween costumes in the same aisles as ones for humans. Some people grab one of those and others take the fun three steps further by putting their clearly superior DIY skills to work. You really can’t go wrong either way. There’s something about a Chihuahua in a unicorn costume that makes people smile. I can personally vouch for that one. Labs dressed like ladybugs seem to have a similar grin-inducing effect. 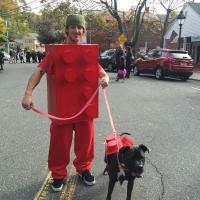 From movie characters to musical legends, these photos of dog Halloween costumes from the Port Jefferson Harvest Festival Pet Parade, are bound to leave you saying awww. 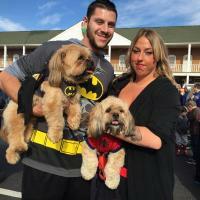 If you’re dressing your pup up for Halloween, share your photos with us on Facebook, Twitter and Instagram. Bubba is not a hound dog nor does he cry all the time. 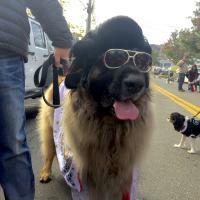 He’s a Leonberger who was such a dead (no pun intended) ringer for Elvis, dozens of people asked to take his photo. 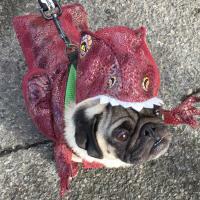 Teddy the pug threw it back to primitive times with this dinosaur costume. This pup’s name is Chewy, so going as a Star Wars character was a must for him. 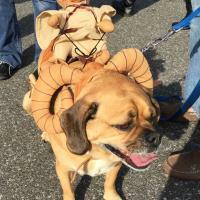 Here he is as a Bantha, carrying around a Tusken Raider. The bad guys don’t stand a chance with this family: Drew (human batman), Sarah (human superwoman), Scruffy (dog batman/Shih Tzu and Yorkie mix) and LG (dog Spiderman/Lhasalier). Don and lab mix Jetta dressed up as your favorite childhood toys. Double the Yorkies, double the cuteness. 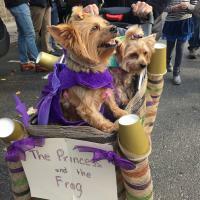 Pop Tart (front) and Tater Tot (back) went as stars of the 2009 Disney hit The Princess and the Frog. 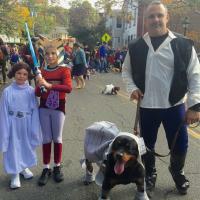 The Negron family, mutt/AT-AT Bo included, can’t wait for the new Star Wars flick. The sun came out and the temps went up to 60, making it a day at the beach for lifeguard Gunner the Shih Tzu. I couldn’t resist. 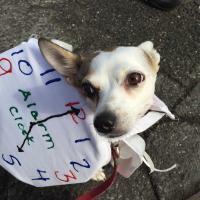 Here’s my Chihuahua mix Topanga dressed as an alarm clock. She actually acts as one every day. Credit goes to my mother for making it.